A ban on sand mining in the area of Thu Bon River’s Cua Dai estuary and Hoi An’s beaches may help save Cua Dai Beach from worsening erosion. 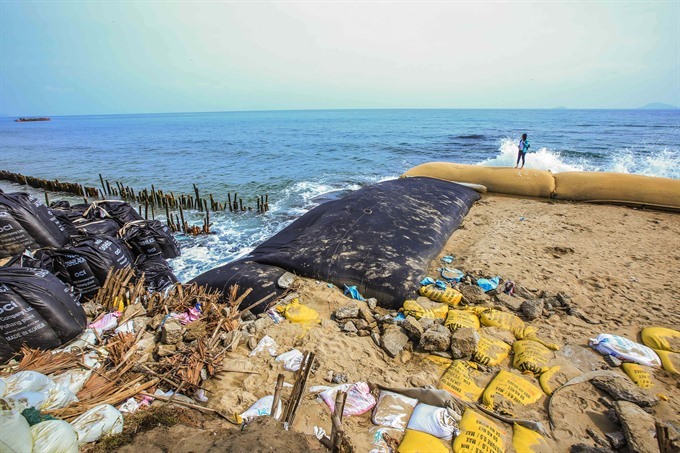 Sandbags on the shore of Cua Dai Beach, 5km to the east of Hoi An City in central Quang Nam Province, to prevent erosion caused by sand mining. The proposal was made by a group of scientists at a two-day workshop, which wrapped up yesterday, in central coastal Quảng Nam Province’s Hội An Town, organised by the Ministry of Agricultural and Rural Development, the provincial People’s Committee, the European Union delegation to Việt Nam and the French Embassy. Professor Nguyễn Kim Đan, leader of the group said ongoing research on erosion in Hội An, conducted since July 2016, cost more than VNĐ12.4 billion ($546,000) funded by the Agency for Development of France and the provincial People’s Committee with support from the EU, found that a shortage of muddy sand flowing from the upstream Thu Bồn river was to blame for the erosion. Constructing hydropower plants on the upstream Thu Bồn River and over-exploiting sand were believed to have caused the shortage of muddy sand, he said. The research also showed that there was a lot of muddy sand in the reservoirs of Đắk Mi 4 and Sông Tranh 2 hydropower plants. Additionally, more big waves were hitting the beach than nine years ago, he added. “It’s a very worrying situation,” he said. Scientists also suggested the province build a 6.5-km underground dyke, about 200m from the beach, to reduce the impact of waves on the beach. Nguyễn Trung Việt, principal of the Central Region College of Technology, Economics and Water Resources said Việt Nam lacked a policy that required all sand exploiters to discuss how to effectively mine sand but still protect the environment. “In developed countries, they did this a long time ago,” he said. Đinh Văn Thu, vice chairman of the People’s Committee of Hội An said the local administration had taken measures to save the beach from erosion but they had failed. Deputy Minister of Agricultural and Rural Development Hoàng Văn Thắng said that beach erosion was happening in many central localities and Mekong Delta provinces due to over-exploitation of sand and climate change. “Finding a radical solution to fix it is necessary,” he said. In the short term, Thắng asked the provincial administration to take measures to minimise erosion’s impact on the beach during the storm and flood season this year. In the long term, Thắng ordered the construction sector to consider replacing natural sand with man-made sand for construction. If localities allowed sand over-exploitation, it would be hard to stop beach erosion, he said. Speaking at the workshop, French Ambassador Bertrand Lortholary said Hội An was a World Cultural Heritage, with a stunning beach suffering from erosion. Thus, the French Government had decided to finance research to help Hội An fix the problem. The French Government would continue its support to improve Việt Nam’s resilience to climate change, sustainable management of flood risks, coastal protection from erosion or recovery of coastal mangrove and more, he said. Ambassador – Head of EU delegation Bruno Angelet said the research was in response to EU commitments made in Paris during a climate summit to support Việt Nam in adapting to climate change. Based on the research results, an investment programme will be designed including hard and soft adaptation measures that could include dyke building, mangrove rehabilitation and capacity building for environmental management, he said. Quảng Nam has 125-km of beach, with Cửa Đại Beach playing an important role in socio-economic development and tourism. However, the beach has suffered from erosion, on average, of a 2km -long section of the beach each year, with a depth of 10-15m.